We are a group of London-based skaters, roller-bladers and wheelchair users who go out together as a group on a regular basis. The wheelchair users are pushed by the skaters, and together we cover a distance of 5 – 12 miles. Our joint trips usually start in one of London’s main parks, and we also use carefully chosen routes through Central London, taking in major landmarks and attractions. Our Street Strolls are led and organised by the London Friday Night Skate & Sunday Stroll. They are marshalled by skaters who go ahead of the main group and manage the traffic, to ensure the safety of the entire group. Another group of marshals maintains a presence behind the the main group to make sure that no-one gets left behind, and that other road users are aware of our presence on the road. 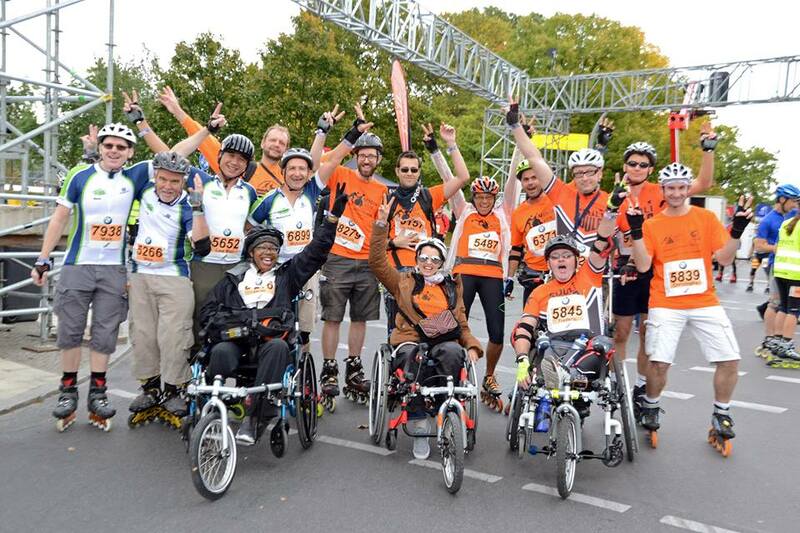 A team from Wheels and Wheelchairs competed at the Berlin Marathon on Saturday 23 September, 2017. Our team was made up of 1 wheelchchair user, being pushed by 5 skaters. We competed against 2 French teams from Mobile en Ville, our sister organisation in Paris. We finished with a time of 2 hours, 13 miutes and 7 seconds. Our 5th Annual General Meeting will be held at the Monkey Puzzle pub on Sunday, 19 November 2016 at 4.30 pm. Come and join us and help us choose which direction the Club will be going in 2018.